Many of these formulas are not designed to remain on the skin for long, and they contain potentially irritating or comedogenic (pore-clogging) ingredients such as Mineral Oil, artificial fragrances and colors. To protect your skin, Dermalogica skin therapists recommend cleansing, moisturizing and priming skin with a product like HydraBlur Primer prior to applying those thick layers of make-up. By adding a layer of primer, or using a shielding moisturizer like Barrier Repair, you can both reinforce your skin's natural protective barrier and smooth out any rough skin texture for better make-up application. 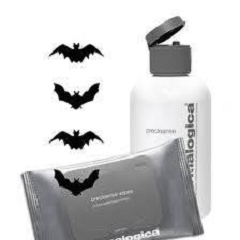 Always cleanse your skin twice with the Dermalogica Double Cleanse that starts with an oil-based cleanser like PreCleanse Wipes. This will help dissolve the oils that comprise heavy make-up without over-sensitizing your skin. Be sure to pay special attention to your chin and nose areas. Rinse with warm water and pat your face dry with a towel. If your pores look clogged or your skin seems stressed, apply a masque for enhanced recovery. If lips feel dry, apply a conditioning treatment balm like Lip Renewal Complex. Then rinse and follow with few spritzes of hydrating toner and the Dermalogica Moisturizer that's best for your skin.